The theater will be located in the upcoming $350 million Franklin Galleria power retail center, located on 115 acres at the intersection of I-10 and Transmountain Road. Transmountain Partners announces plans for a new 90,000 sq. ft. entertainment complex to begin construction this summer with a target opening of May 2018. 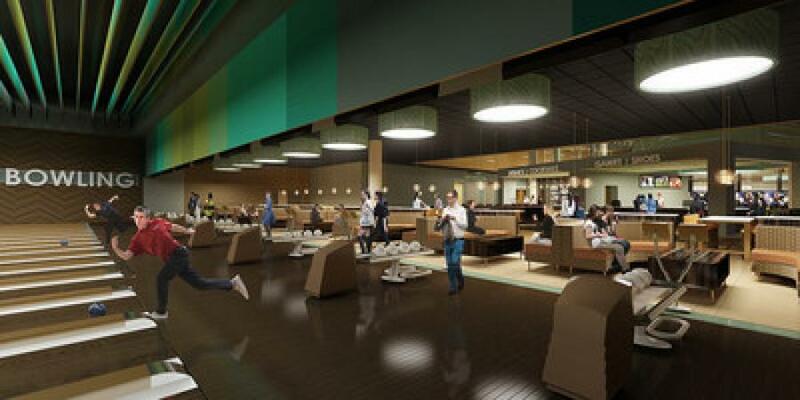 Cinergy Entertainment will boast 10 state-of-the-art auditoriums; 18 lanes of upscale bowling with sophisticated design and seating; two full-service bars; multiple escape rooms; a fully-loaded game floor with more than 110 interactive games; redemption store; premium dining options; a multi-level laser tag arena; Sky Walker with a zip line (a gravity-defying, black light overhead ropes course); and multiple event rooms. Auditoriums will showcase large wall-to-wall screens, enhanced sound, and spacious electric recliner seating. The new El Paso complex will feature Cinergy's premium large-format auditorium, EPIC “Experience Perfection in Cinema.” The EPIC auditorium was developed to provide an amazing large-screen experience using the most advanced technology and techniques available. EPIC is the ultimate in movie immersion and comfort. Featuring a massive 64 ft. x 35 ft. silver screen, Dolby Atmos sound system with more than 62 channels, stunning clarity, bright digital images utilizing a 4K projection system, ultra-plush electric leather recliner seating, and the newest movies every week, you'll be lifted from your seat and taken straight into the movie. All auditoriums will feature luxury electric recliner seating with swivel table and extra wide space between rows for maximum comfort, making the dine-in theatre experience that much better. “This new location will exceed our guests' expectations by offering their favorite amenities and going beyond with new thrilling enhancements, including Cinergy's first escape rooms. An escape room is a physical adventure game in which players must use elements of the room to solve a series of puzzles to escape within a set time limit. The experience will be one-of-a-kind; this is the future of the movie-going and entertainment industry,” stated Darek Heath, Cinergy's VP of Operations. Franklin Galleria, in addition to the Cinergy theater, will include retail, multi-family developments, hotels, golf venues and upscale bars and restaurants intended to revitalize far-west El Paso. Franklin Galleria is being developed by Transmountain Partners under the leadership of Gonzalez. For more information, Cinergy.com and westretail.net.